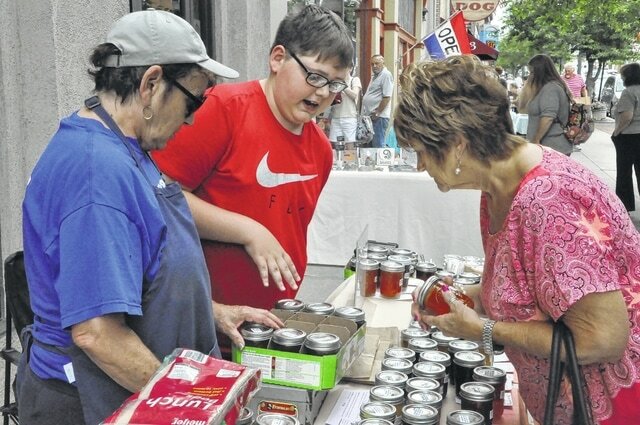 Thomas Cummings (in red) explains deals on his family’s jam to Kathy Wright, while his mother, Violet Cummings, packages the jam Wednesday afternoon at the Main Street Delaware farmers market on North Sandusky Street. The farmers market runs from 3 to 6 p.m. Wednesdays. There is also a farmers market on Saturdays from 9:30 a.m. to 12:30 p.m.